Consistently ranked as one of the nation's leading academic medical institutions, this is the 20th year Emory University Hospital has made the list. Emory University Hospital again joins the prestigious ranks of America's top medical institutions in the annual U.S. News & World Report guide to "America's Best Hospitals." Consistently ranked as one of the nation's leading academic medical institutions, this is the 20th year Emory University Hospital has made the list. For 2010, Emory is positioned among the nation's best hospitals in 11 specialties, including garnering five top 20 rankings. Overall, Emory is one of only 152 hospitals out of more than 4,800 medical centers in the country to be named in even one of the magazine's top 50 specialty rankings - with only Atlanta's Shepherd Center joining the national ranking from Georgia. 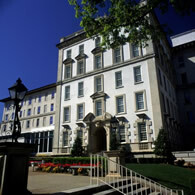 Besides Shepherd’s rehabilitation ranking, Emory University Hospital is the only hospital in the state of Georgia to have any specialties listed among the nation’s elite. These Emory specialties span the spectrum of patient needs - from ear, nose and throat disorders to geriatric care, to cardiology and neurosurgery. By specializing in skills and services both complex and complicated, Emory is a leading referral center for patients, doctors, and hospitals around the southeast and the world. The Emory Heart & Vascular Center, consistently included among the nation's top 20 institutions, has recently claimed many significant "firsts," from the first cardiac catheterization lab in Georgia to the nation's first coronary stent, the world's first minimally invasive triple off-pump bypass surgery, and Georgia's first implantable defibrillator. Such technologies and advancements continue to position Emory as a healthcare provider of choice among Georgians and the nation, as recognized in this year's comprehensive report for excellence. "We make a promise and a commitment to our patients and their loved ones each and every day to provide the very best care and service in a patient and family-centered environment. These rankings are but one way we measure our progress in delivering on that promise, and help us to continually improve on our service and challenge ourselves as health care professionals," says John T. Fox, Emory Healthcare president and CEO. “Being again recognized across the board in so many different specialties, from cancer to geriatrics, and cardiology to disorders of the kidneys, makes a tremendous statement about Emory’s impact on not only healing the sick, but preventing future illness. I share my thanks, appreciation and admiration with every physician, nurse, employee, volunteer and supporter who has made this honor possible today. We have chosen to embrace at Emory the priceless opportunity and responsibility of not only producing the incredible research that will open doors to new advancements and discoveries in medicine today and in the future, but also in delivering that care at the bedside in a compassionate way.” says Fox. "Emory's rise in the U.S. News & World Report in cancer rankings is great news for Georgia," says Walter J. Curran, MD, executive director of the Winship Cancer Institute. "As the only NCI designated cancer center in the state, we are working hard to serve as a resource for oncologists and patients everywhere, but especially in Georgia. Our emphasis on teamwork and collaboration pays dividends in exceptional care, our ability to offer groundbreaking clinical trials, and innovative research. These rankings are an important indicator of progress, and we intend to continue improving for the benefit of our patients and their loved ones." According to U.S. News & World Report, only 152 of the 4,852 hospitals evaluated performed well enough to rank in even one specialty this year. To be considered in any of the 12 data-driven specialties, a hospital was required to meet at least one of four criteria: be a teaching hospital, be affiliated with a medical school, have 200 or more beds, or have at least 100 beds and at least four of eight key medical technologies available - like a PET/CT scanner, and certain targeted radiation procedures. Next, the hospitals had to meet a volume requirement- a minimum number of Medicare inpatients from 2006 to 2008 who had certain procedures and conditions in a given specialty. Finally, as in past years, each hospital received a U.S. News score from 0 to 100 based on four basic elements: reputation, mortality data, patient safety, and care-related factors, such as nursing and patient services. The 50 top performers were then ranked for each specialty. This year's rankings may be found online at: www.usnews.com/besthospitals and in newsstands beginning July 27.